Something I miss greatly about living in England is the tradition of the “Cream Tea”. 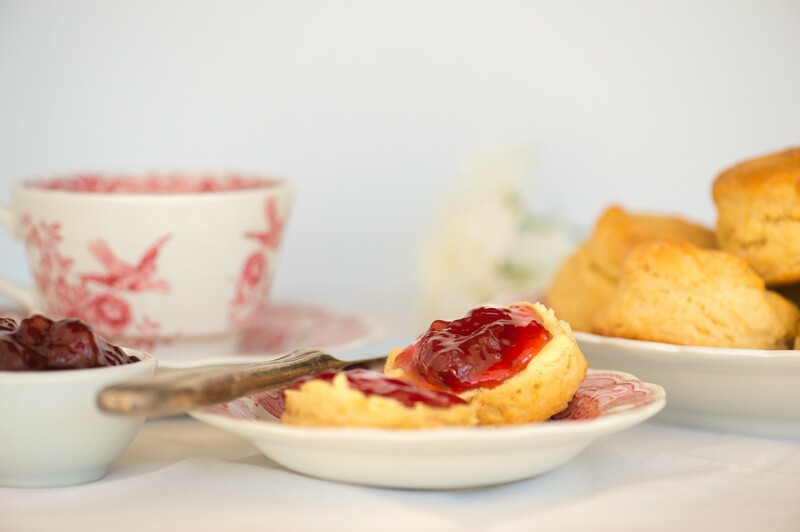 Freshly baked scones, with lashings of jam and clotted cream (with a cup of tea on the side of course) – simply delightful! 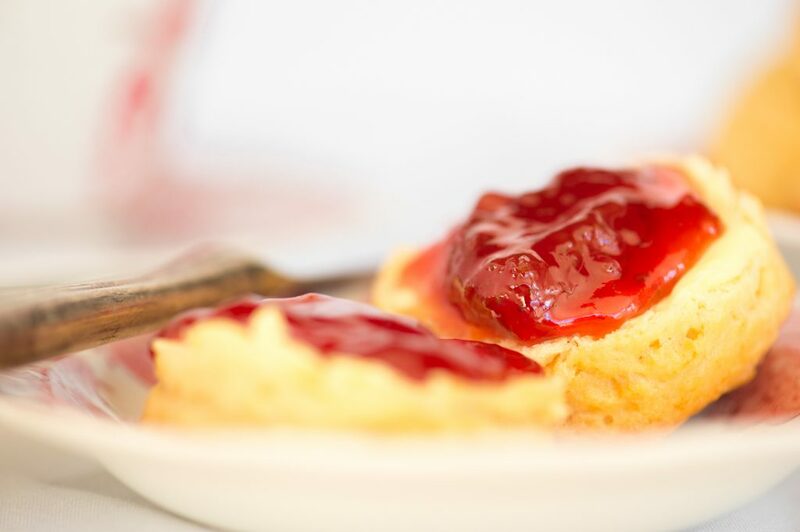 Clotted cream, which we sadly can’t get in SA, is a very thick, rich and spreadable cream. In some parts of England it is spread on the scone first instead of butter. Nevertheless, I feel that one can make up it’s absence by simply using generous quantities of thickly whipped cream or double cream instead. Classic scones should have a golden crust and a light, fluffy texture. It’s really important to incorporate a lot of air into the mixture and use loads of baking powder! Also, try not to handle the mixture too much when you roll it out, and don’t over-flour it. The more sticky it is the lighter the resulting scones will be. This is a quick and easy recipe so it’s great for last minute visitors! 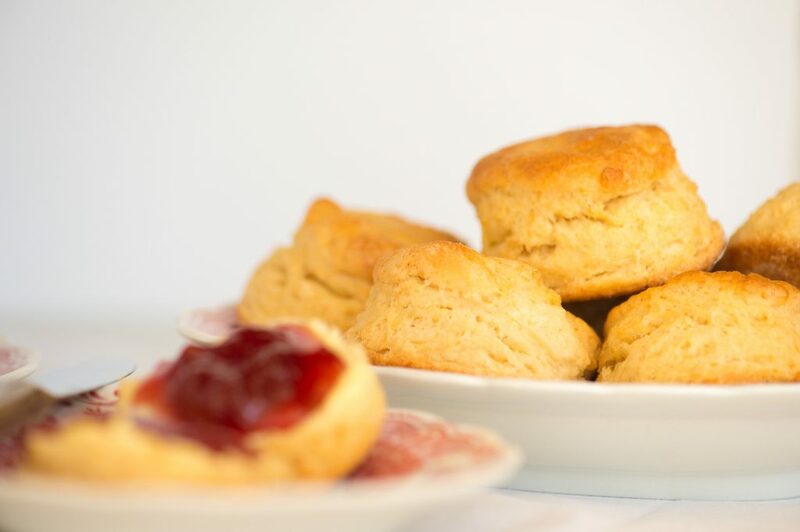 The scones are best eaten the day they are made, otherwise warm them up in a hot oven for a few minutes. Sift flour, baking powder and castor sugar together in a large bowl. Rub in the butter with your fingertips until the mixture resembles breadcrumbs, or use a pastry cutter. Lightly beat together the buttermilk and vanilla. Pour this mixture into the flour mixture, and cut in with a round-bladed knife until it comes together nicely. On a floured surface, gently pat the dough into a 2cm thick rectangle. It will still be quite sticky but try not to over-flour it. Cut out 5cm diameter rounds with a floured cutter. Place onto a greased baking tray and brush lightly with milk. This will give a lovely golden colour to the scones. Allow the scones to stand for 15 minutes before baking. This lets he baking powder start to work and improves the volume of the scones. Bake at 220°C for 10-12 minutes, then allow to cool on a wire rack. Delicious when served with a smear of butter, spoonful of jam and generous dollop of whipped cream! For a savoury change, omit the sugar and add 1 1/2 cups (4 oz) of grated cheese to the mix. Then brush the tops of the scones with milk and sprinkle with another 3/4 cup of cheese. A perfect accompaniment to soups and chowders.